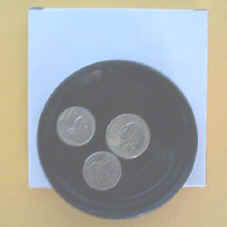 Discount Magic - Coin Tray. A volunteer counts a few coins (say three coins) and places them on a small plastic tray. As the magician dumps the coins into the spectator's hand they multiply to ten or twelve coins. Can be used to produce some vanished coins. A very inexpensive prop to multiply coins or keys or any such other small and flat item. The item comes boxed. This product was added to our catalog on Wednesday 04 February, 2004. Quite good but can only be used for a few effects. Cannot be ..